As expected, Wednesday night’s storms were mostly a non-event for Houston, with most of the region outside of the Brazos Valley picking up 1.0 inch or less of rainfall. We’re now going to enjoy a few somewhat cooler nights before the onshore flow returns. After this, however, it appears the region will settle into a warmer and definitely more humid pattern for awhile—a good reminder that summer is nigh. Skies will be clearing out today, and this will allow highs to probably get to about 80 degrees despite a modest northwesterly wind. Temperatures will fall off this evening as the sun goes down, and with clear skies, areas well inland may see the upper 50s, while most of Houston stays in the low 60s. A banner day, with lots of dry air, sunshine, and light winds. High temperatures will get into the mid-80s. We’re going to have one more cool night, as lows get down into the low 60s in Houston again. This really will be the last hurrah for dry air, for awhile, so enjoy it. It’s a bit of a messy forecast for the greater Houston region Wednesday and Wednesday night, so let’s break it down. 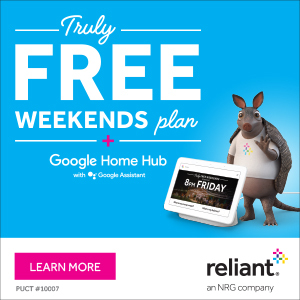 For the most part during daytime hours, the metro area of Houston, including immediately surrounding counties, will experience mostly cloudy skies, with a 30 to 40 percent chance of light to moderate rain showers. In Houston, rains look most likely around noon before a break this afternoon. 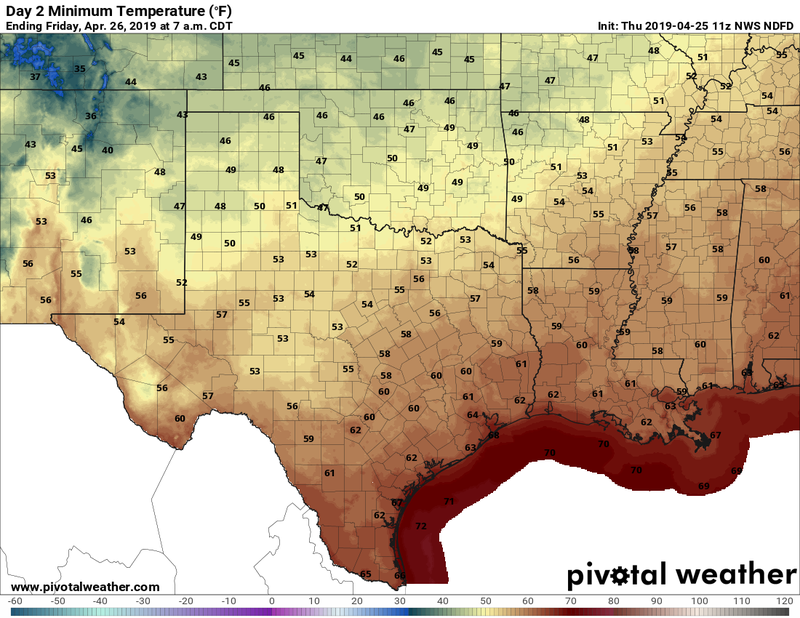 However, in the Brazos Valley including College Station, we have concerns later this afternoon, as an atmospheric disturbance migrates northward and combines with an approaching front. At this point, high resolution models point to the potential for some fairly heavy rainfall from mid-afternoon through the early evening. We’d expect some areas to see 1 to 3 inches of rain, with isolated higher totals. 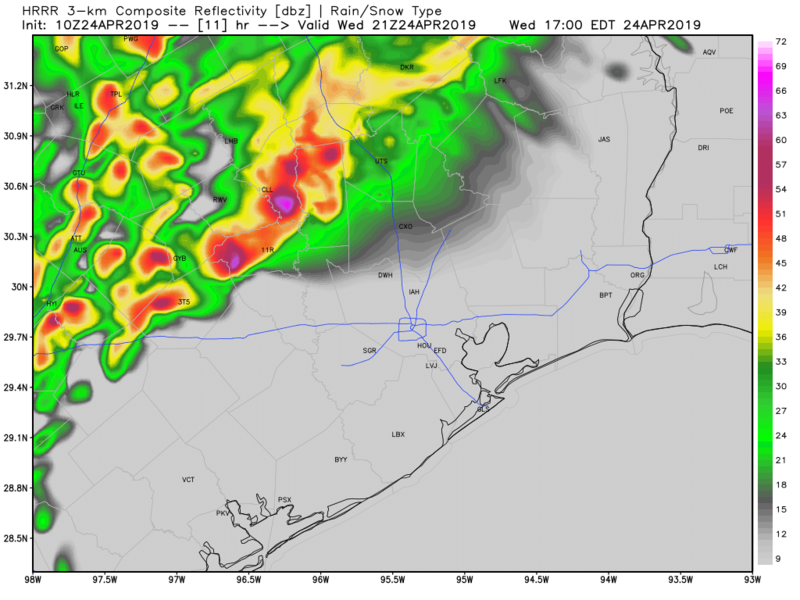 For Houston, itself, stronger storms are unlikely to move into the region before sunset (or later) as a line of showers and thunderstorms pushed through from west to east. I’d guess this line reaches the western part of the metro area between 7pm and midnight, and pushes through the city during the overnight hours. For now, the best chance of storms (mainly a hail and damaging wind threat) appears likely north of Interstate 10. Rain totals of 0.5 to 2.0 inches remain likely in Houston from this system, although I’m not sure whether we’ll see a solid line of storms, or whether it will be broken by the time it reaches Houston. It’s a rather humid morning outside—almost, but not quite summer-like with lows of only about 70 degrees—that offers prelude for the potential heavy rain and thunderstorms on Wednesday night and Thursday morning. Our weekend forecast still looks quite pleasant for late April. A somewhat disturbed atmosphere may lead to scattered showers during the daytime hours for Houston, but any accumulations will be slight. Skies will be mostly cloudy regardless, and this should help keep a check on temperatures, limiting them to the upper 70s or 80 degrees. Tuesday night should be another warm and humid affair for the region. Much of Wednesday should be similar to Tuesday, with a 20 to 30 percent chance of rain area wide, but things will change Wednesday night and Thursday morning, as a large line of showers and thunderstorms sweeps through the region from west to east. Right now, it appears as though this line of storms will push through between around midnight and sunrise, dropping between 0.5 to 2.0 inches of rain for most people, but we can’t rule out some isolated areas of 3 inches or a bit more. 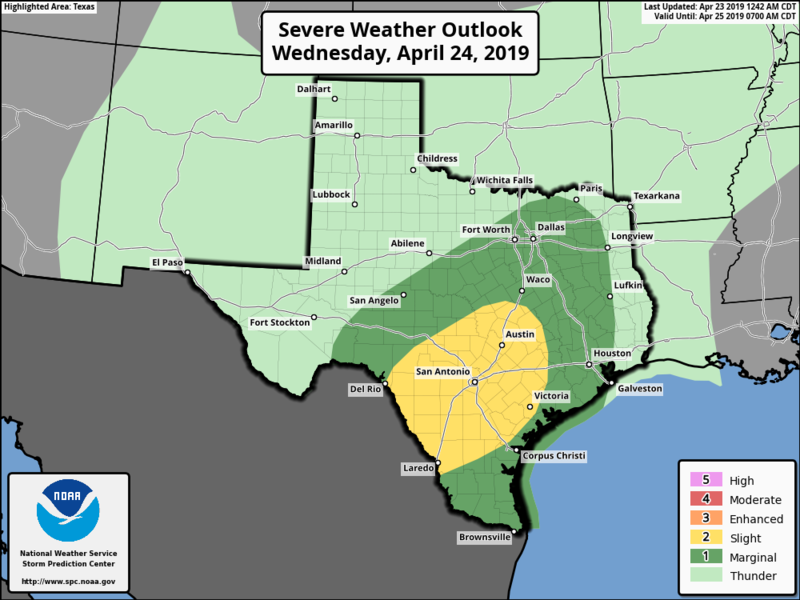 There is the possibility of some severe weather in the form of hail and thunderstorms, but atmospheric conditions will favor this more to the west and southwest of Houston (as shown in the forecast map from NOAA above), rather than over the metro area itself. Depending on the timing of this system, which is still subject to change, the worst of it could be over before Thursday morning’s commute begins, or the storms could still be moving though—let’s hope for the former. A few scattered, light showers remain possible later in the day on Thursday.